Sure Fire Professional Gimmick Holds TWO Matches! This miniature device enables the you to pluck lit matches from your coat label, pocket or anywhere else you desire. 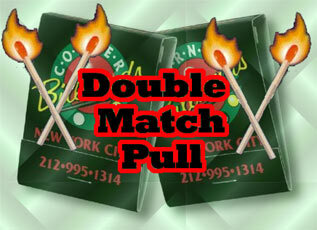 Holds TWO Matches at the SAME time! Produce Right After each other! Manufactured of Stainless Steel to last a Lifetime. Holds Wood or Paper Matches! Wow! Great iteam and you can use it forever just with easy m ..